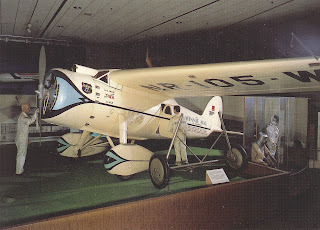 Outgoing postcard US-3755619 to Canada shows "Winnie Mae", a seven-seat monoplane Vega 5C, on display at the National Air and Space Museum in Washington, DC. It was made by Lockheed in 1930 with modified tail surfaces for higher gross weight operations. Flew by famed aviator Wiley Post, it set many records, including around the world flight in eight days by Wiley Post and navigator Harold Gatty in 1931; the first solo flight around the world in 1933; the world's first flight using pressure suit in 1935 that reached the stratosphere at 547 km/hr or 340 m/hr. The "Winnie Mae" was named for the daughter of F. C. Hall, the original owner and a close friend of Wiley Post. Today it is the 112th anniversary of Wright brothers' first powered flights. According to USPS Postal Bulletin 22430 published on December 10, 2015, Kitty Hawk, NC Post Office is offering a pictorial postmark to commemorate the occasion. I am sending the card, along with several others, to get this special postmark. Such requests must be postmarked no later than 30 days following the requested pictorial postmark date.